?The mountains are calling and I must go.? This blog is not about the itinerary of my trek. There are plenty of these available on the net. It's a compilation of the feelings and thoughts that drifted through my mind as I walked on braving the altitude, the extremes of day and night time temperatures, the ascent which tested my heart and lung capacities, the descent which tested my knees and toes. It is about the victory of mind over the body. It's about a dream come true. It's about visiting paradise and coming back. 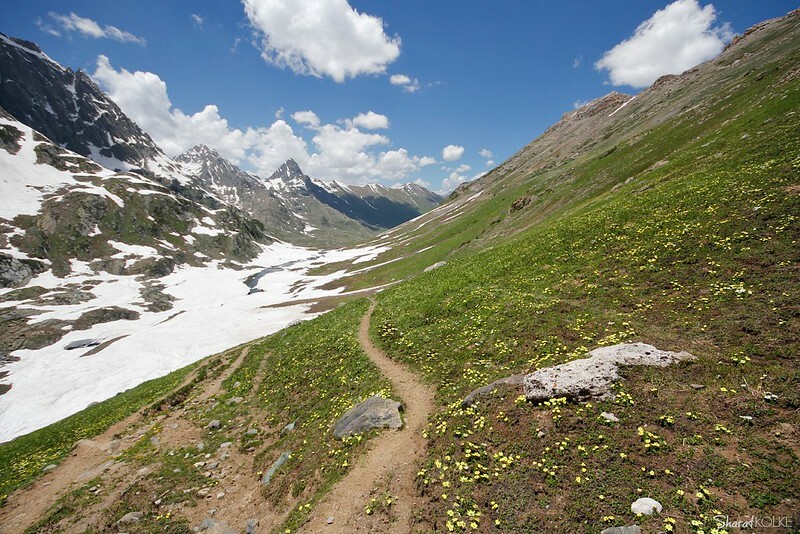 There may be higher and more difficult and dangerous treks, but there cannot be a more beautiful trek. The mountains had been beckoning since long and I was yearning to visit it. The time had come to fulfill my desire. Begin a new relationship, not knowing how it will sustain the ravages of time. Nevertheless a start was made. The choice couldn't have been better. In the lap of the mighty Himalayan peaks, giving in myself willfully into the arms of one of the most beautiful places on earth - Kashmir. It was a place where civilization did not exist. I was beyond the shallow world of all things man-made. God, religion, caste, creed, boundaries and politics did not exist. This trek had a hidden agenda. 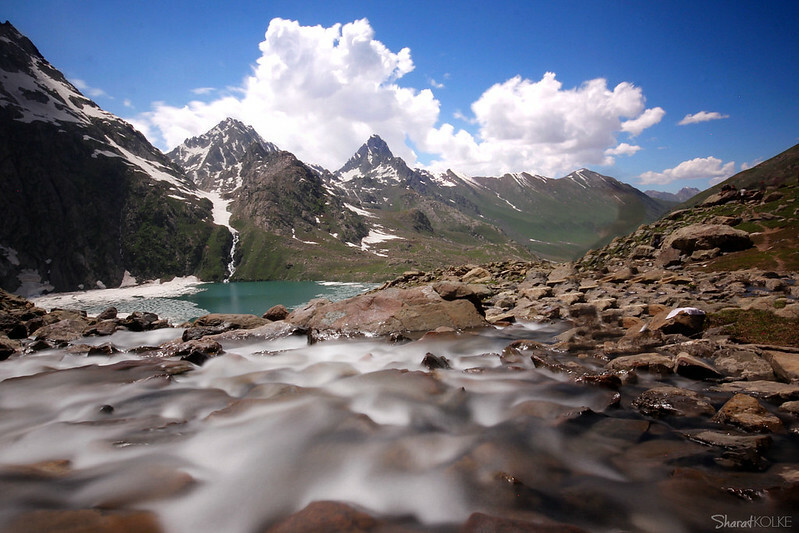 To discover the hidden lakes, the great alpine lakes of Kashmir, which would unravel themselves only to those who dared to visit them. Hidden in the valleys between the towering snow peaks of the mighty Himalayas. This was a Paradise! God, if existed probably stayed here and was everywhere and in everything. -Edna st. Vincent, ?Afternoon on a Hill? With every new day, every descent or ascent, or even just round the corner, new vistas unfolded in front of my eyes.This trek involved walking on snow, strolling in the meadows, crossing rivers, climbing rocky surfaces... almost everything that a trek is supposed to have. I wondered as I trekked on, could the sky be more blue, the clouds more white and the grass more green? At places, the trails were narrow, lined by small yellow flowers. 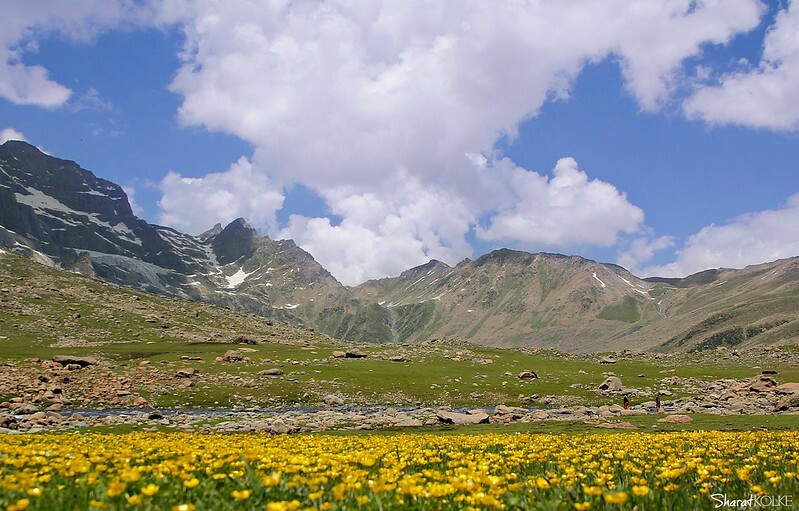 The wild Himalayan flowers were one thing that stood out in this trek. I saw them in many hues, yellow, and white, purple and blue. These small mountain flowers, some blooming in clusters like a bouquet, some growing in the midst of rocks, some by the riverside. Each flower bloomed by itself in the wilderness, spreading its fragrance, attracting the bees for self-propagation and then withering away. They looked unusually fresh in the crisp and cool mountain air. Their beauty was a sight to behold for those who dared to reach up to them. The soil and the rocks remain covered by snow for about 6 months. As temperatures rise with the advent of summer, and the snow starts melting, greenery sprouts everywhere, interspersed by swathes of yellow, white and purple. The seeds remain buried all this time, waiting patiently for their chance, their resilience making them victorious. It?s a sort of ?Jugalbandhi? between the snow and the flowers and both win. trails by sharat_kolke, on Flickr?I wonder if the snow loves the trees and fields, that it kisses them so gently? And then it covers them up snug, you know, with a white quilt; and perhaps it says "Go to sleep, darlings, till the summer comes again.? Every day had a destination, a place to reach and relax - the campsite. 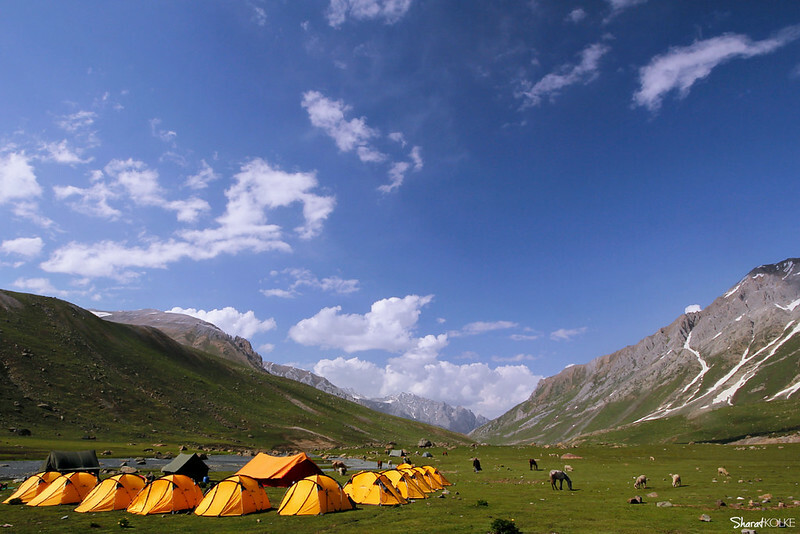 The fluorescent yellow tents, set midst the green meadows, surrounded by partially melting snow peaks, the river flowing next to it, the source of pure, genuine mineral water drunk straight from the source. I always looked forward to reaching it. It was my home for 7 days. 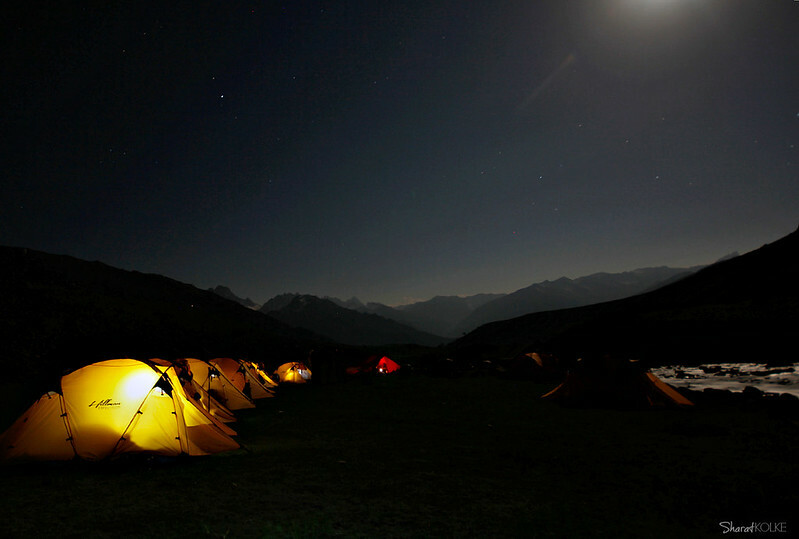 The sight of these tents soothened my tired body and fatigued mind like an elixir. But the path was different for each one. I had to ascend sometimes, and occasionally had to descend to reach it. There was no way one could take the path for granted. It was beautiful for those who valued it. It was arduous for some, a chore for others. Every step had to be watched, every moment cherished. A wrong step and this very path could turn treacherous. As I treaded on it, I thought, ?Isn?t it the same in our routine life too?? We start in the morning, undertake various chores throughout the day with a result to achieve by the day?s end. Every decision is like a step taken. A wrong one and the consequences could be disastrous. I had to be aware of myself, of the steps I take and of my surroundings. At places, the clear, blue skies seemed to bend down and kiss the green earth. The clouds hanged as if suspended by invisible threads. Occasionally the dark rain clouds came nearer threatening to burst open, but thankfully it just remained a threat. While walking on the rocks and snow and crossing rivers I had to be careful, strolling on the meadows was a luxury. At places, grazing sheep, camouflaged by the stones, dotted the landscape. There were thousands of them, grazing blissfully taking their own sweet time. Some of them followed by their young lambs was a visual delight and brought a smile on my face, the tiredness forgotten. I always woke up by 4. Daybreak began by then. It was always chilly in the mornings before the sun rose and covered me with its warm blanket. Sitting on the rocks, watching the gurgling brooks flow past, the early rays of the sun imparting a golden hue to the surrounding peaks and braving the chill was my morning routine. I knew that these moments won?t last forever and wanted to make the most of it. The cold numbed my body and my thought process. I couldn?t think of the past, nor contemplate on the future. I was only in the present then, savoring that moment in time, making an imprint on my mind, one that would last forever and remain a permanent memory in my mind?s eye. The water in the rivulets fed by the melting glaciers increased as more snow melted under the glare of the rising sun. The waters flowing past like time slipping away, the same waters never return. It is a one-way process. The lakes were the highlight of this trek. Untouched, unspoilt, azure blue, alpine lakes. The Vishansar, which changed colors from morning to late evening. The adjoining Krishansar, which was still partially frozen. And both of them seen together as we ascended to a altitude of 13000ft. 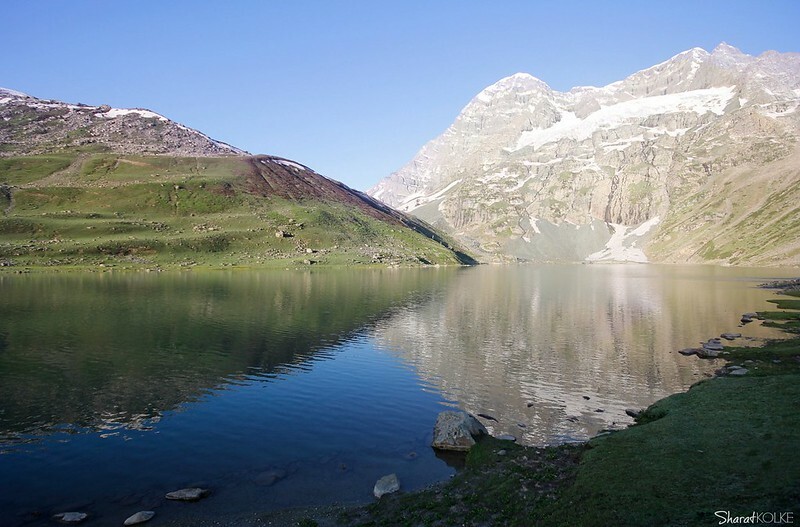 The Gadsar, i.e a lake full of fish which had a turquoise hue. The 7 lakes of Satsar, of which we could see 3 lakes. And last but not the least, the twin lakes of Nandkul & Gangabal over which towered the inaccessible Harmukh peak at 16000 ft. The placid, still and peaceful waters of these lakes seemed contagious. Occasionally a breeze blew causing the surface to ripple a wee bit. The same feeling came over me as I sat on its banks gazing into the waters for long, the breeze making me shiver a bit. ?Adopt the pace of nature: her secret is patience.? The nights were as beautiful as the day albeit different in it?s own way. The moon grew bigger as the days passed and on our penultimate day it was so bright that the moonlight lit up the entire valley. The rivers sparkled and the snow peaks shone in its light. The skies were covered with a million twinkling stars. Lying on the grass, watching the stars and the few clouds floating by was a childhood fantasy come true. As the trek neared its end, just like all good things end, a mixed feeling overcame me. Happy at the thought of returning home to my loved ones, sad at the thought of leaving this Paradise, and going back to a materialistic world, a egocentric world, of world of ruthlessness and live and let die. But I have promised myself; I will be back, a promise I mean to fulfill soon. 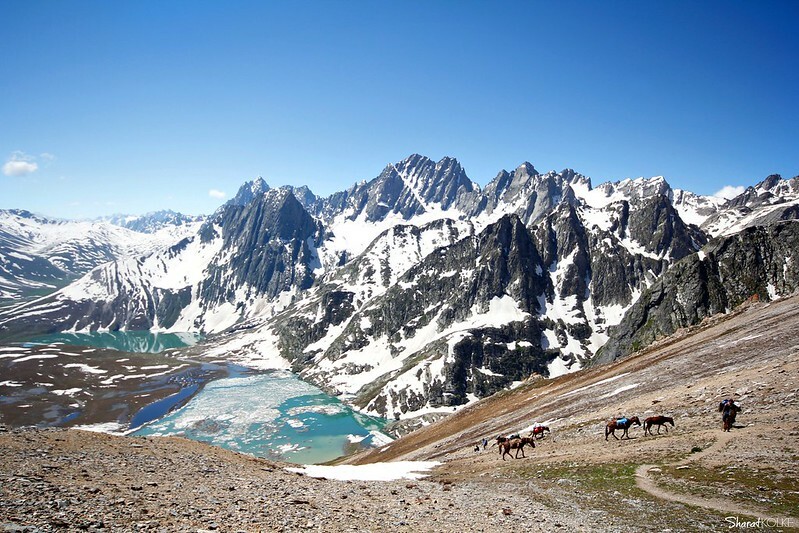 PS: This trek called as "The Great Lakes of Kashmir" trek starts at Sonmarg at an altitude of 8000ft. It ends at Naranag agin at around 8000ft after 7 days and 60kms of hiking over a maximum altitude of 13500 ft. Superb! You really set my heart buzzing and the adrenal running. I am sure you must have enjoyed this trek. Wow ! Wish I had the stamina for such a trek. Beautifully written and lovely photos ! Superb thanks so much for sharing with us. It was very nice reading it Doctor. Loved the thoughts penned down which can be experienced in the mountains itself. How much stamina do you think would this need? Not quantifiable, but how would you scale it against say a Yeoor trek [Yeoor being 2 on 10]? Oh this is a beautifully written report..loved it and enjoyed it thoroughly..you write amazingly well doc..how much time did it take ? Thanks Gautam. It will be 7. What the organisers recommend is, that you should be able to run 5kms in 1/2 an hour. Thanks. Time... for the trek?